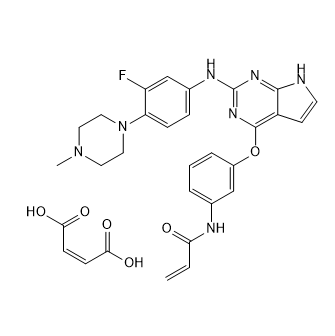 Avitinib maleate is a pyrrolopyrimidine-based irreversible epidermal growth factor receptor (EGFR) inhibitor with an IC50 of 7.68 nM.Avitinib, also known as AC0010 or AC0010MA, is an orally available, irreversible, epidermal growth factor receptor (EGFR) mutant-selective inhibitor, with potential antineoplastic activity. Upon oral administration, avitinib covalently binds to and inhibits the activity of mutant forms of EGFR, including the drug-resistant T790M EGFR mutant, which prevents signaling mediated by mutant forms of EGFR. 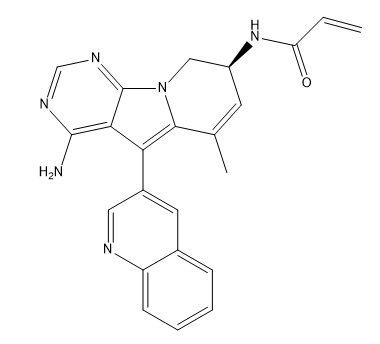 This may both induce cell death and inhibit tumor growth in EGFR-mutated tumor cells. EGFR, a receptor tyrosine kinase that is mutated in a variety of cancers, plays a key role in tumor cell proliferation and tumor vascularization. As this agent is selective towards mutant forms of EGFR, its toxicity profile may be reduced when compared to non-selective EGFR inhibitors, which also inhibit wild-type EGFR.